So, ladies and gentlemen, here is my two hundred and sixtieth consecutive weekly post. Which means that A Folk Song A Week is five years old. When I started the blog, I guesstimated that I knew about 150 songs. Obviously that turned out to be a significant understatement – the last time I did a reckoning, I counted up about another fifty songs that I know, plus more that I don’t know yet, but really must get around to learning some time. Given time, I hope to post all of those here. However, after five years, I’m going to cut myself some slack. This is certainly not the end of the blog, but I will no longer be maintaining a strict weekly publishing schedule. That’s not to say there won’t be a post next week, or the week after – but don’t count on it. So, if you want to be sure of never missing a post, do subscribe using the tools on the right. I have to say, starting up this blog was one of the best decisions I ever made. I started it at a time when I really wasn’t doing enough singing – this way, I thought, I’ll be forced to sing at least once a week. Also, a couple of years previously, I had had a medical problem with my throat, which prevented me from singing for the best part of a year. I was (am) afraid that the problem might return, and I wanted to document my repertoire while I could. Primarily for my own benefit, but also for my children, and for posterity – whether or not posterity was remotely interested. Obviously, I can’t speak for posterity, but it has been exceedingly gratifying to receive many positive comments – here, on Facebook, and just bumping into people at gigs, sessions and elsewhere. So thank you, everyone who has had nice things to say. I started the blog for myself, but it’s still very satisfying to know that other people appreciate it. So, what have I learned? Well, not very many new songs, I’m afraid. I’m sure there were others, but the ones that spring to mind are ‘Georgie, ‘The Bonny Bunch of Roses O’, ‘Ye Boys o’ Callieburn’ and ‘Jack Williams’. But then there have been other songs which I’d half known for years, but which this blog prompted me to learn properly; for instance ‘All things are quite silent’, ‘Master Kilby’ and ‘House in the Country’. And then there have been a great many songs which I used to sing, had somehow allowed to fall into neglect, and then – reviving them to post here – was delighted to find were really far too good not to sing: ‘Do Me Ama’ and John Kirkpatrick’s ‘Dust to Dust’ for example. Oh, and I’ve also gained a greater facility at knocking up simple concertina accompaniments – something I’ve tended to agonise over in the past – when the need arises: by way of example, see ‘Here’s Adieu Sweet Lovely Nancy’, ‘Warlike Seamen‘, ‘Saint Stephen’ and ‘The Somerset Wassail’. And I’ve learned so much writing up the weekly blog entries. Even where I thought I knew quite a bit about the song already, a bit of digging around on my bookshelves and on the web has invariably produced further information. There’s such a wealth of information online now for anyone with an interest in these old songs, and the sources continue to multiply. When I began, we were still marvelling at the EFDSS Take Six resource. But that turned out just to be whetting our appetite for the riches which the Full English archive would offer. The Bodleian, too, has expanded and improved its Broadside Ballad site. And then there’s sites like Tobar an Dualchais, Gloucestershire Traditions and, one I found just recently, The music of Sally Sloane. My heartfelt thanks to all the people involved in building and updating these sites. And to everyone whose contributions to Mudcat I have plundered over the last five years, especially to the late Malcolm Douglas, who I never knew, but whose name I am always pleased to see cropping up on a thread about a song’s origins. And a massive thank you to Reinhard Zierke, whose Mainly Norfolk site is normally my first port of call when researching a song (if only because it always provides me with a Roud number and a link to the Full English), and whose comments here have been unfailingly constructive and helpful. Reinhard – you’re a gent. As for this song, for a long while I’ve had it stored up to use as The Last Song On The Blog. Well, this isn’t actually the Last Post, but it seemed like a suitable time to post it here. Bob Copper sings it on Turn o’ the Year, disc 4 of the Leader A Song for Every Season box set; although I learned it from my mate Adrian Russell, on one of the sing-songs we used to have driving between country pubs in Kent. 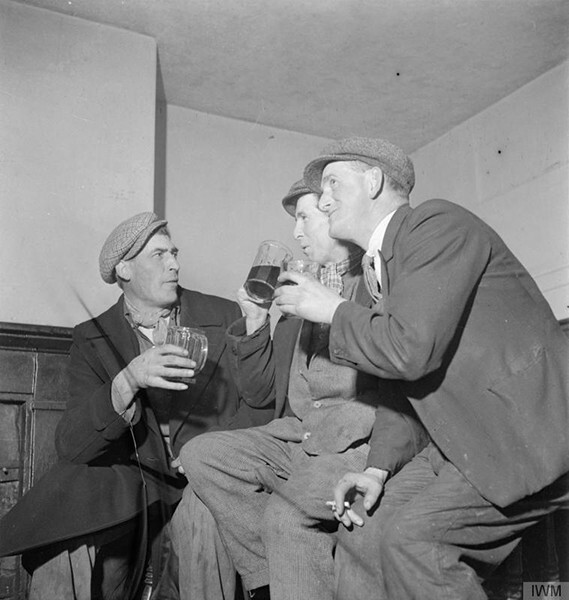 Being polite, Bob Copper sings “give the old bounder some beer”. Adrian, I’m pretty sure, always used to sing “give the old bugger some beer”, which I imagine is closer to what Bob and his father’s Rottingdean companions actually sang between songs in the Black Horse. But always remember the singer is dry. He’s had some, he’s had some. Then give the old bounder some more. O, half a pint of Burton won’t hurt’n, I’m sure. And so say all of us. 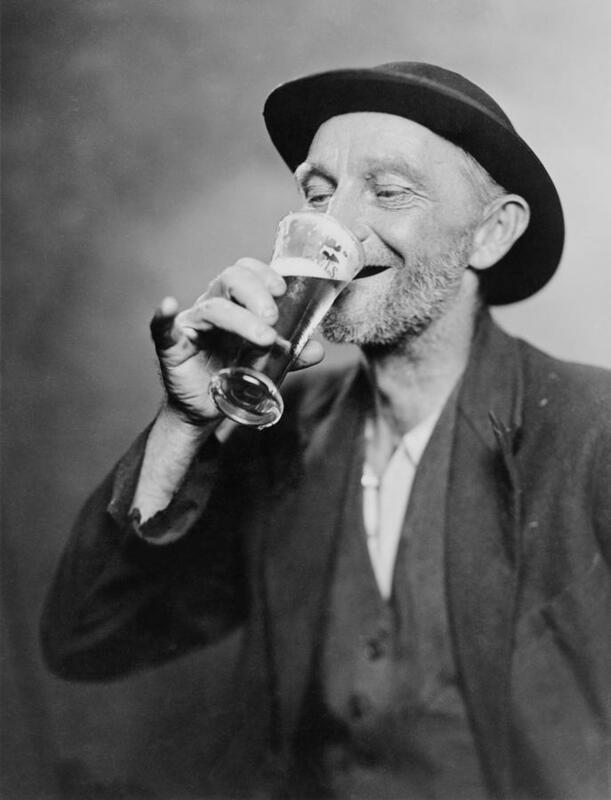 Happy old man drinking glass of beer, 1937. I’ve had a cold this week, so have not been able to record a new song for the blog (and, unusually, I’d used up all the recordings in my store). So here’s one I prepared earlier – 15 years ago, to be exact. It’s a track from our CD A Taste of Ale, recorded to accompany Roy Palmer’s book of the same name. As far as I can see, all Roy’s book has to say about the song is that the words are anonymous, nineteenth century. Presumably his source was this ballad from the Bodleian collection, printed in Manchester in the first half of the nineteenth century. The mail coach guard, from Broadside Ballads Online. The tune was composed by Roy’s wife, Pat. Although it’s an inconsequential little song, I have to say I rather like our arrangement, and was very pleased with the tune I came up with for the instrumental breaks. Last week I referred to Pentangle’s ‘Lord Franklin’ possibly being the only known instance of Bert Jansch playing concertina. Well this is almost certainly the only recording in existence of me playing the autoharp. Incidentally, I’m linking to a YouTube video below. It’s one of those videos where there’s nothing to watch, just a still image accompanying the audio stream. I noticed just recently that all of the Magpie Lane albums for Beautiful Jo have been uploaded to YouTube by “The Orchard Enterprises”. According to Wikipedia they are “a music, film, and video distribution, marketing, and sales company and top-ranked Multi-Channel Network that works with independent artists, labels, and other content providers to distribute content to hundreds of digital and mobile outlets around the world, as well as physical retailers in North America and Europe”. Now I’m not sure how I feel about this. Our albums have been on Spotify for some while now – I think this coincided with, or was a consequence of, Beautiful Jo’s catalogue being put on digital platforms such as iTunes, eMusic and Amazon. Record companies and artists get an infinitesimal payment for each Spotify play. But at least there is some payment. Having the albums free on YouTube really does seem to be just giving it away. I’m not averse to making my music freely available, if I choose to do so myself (this blog being an obvious example!). You can listen to my album Love Death and the Cossack for nothing over on Bandcamp. And the same goes for the three Geckoes albums. But we chose to put them online. And you have the option of paying me / us if you want to download the albums as high-quality audio files. Some years ago, I was contacted by a bloke who had put half a dozen of our songs on YouTube, with accompanying montages of images. He was looking for our retrospective blessing. Clearly he was a fan, and he had the best of motives, but I’m afraid I couldn’t bring myself to send him any kind of a reply. As someone whose day job involves a certain amount of work around avoiding copyright infringements, I was flabbergasted by the number of separate copyrights these video and audio mash-ups must have violated. But no point complaining, I thought, it’s just the way the world is going. Little did I know just how right that would turn out to be. Still, if you would like a physical copy of A Taste of Ale, or indeed any of our albums, do come and see us at one of our gigs this Christmas, and buy a copy! If you were a regular at Whitstable’s Duke’s Folk, or at Oyster Ceilidh Band dances in the seventies, you’ll almost certainly remember this song, as it was an oft-performed favourite in the repertoire of top local band Fiddler’s Dram. It was the final track on their debut LP To See the Play, and I’ve a feeling it had also been one of the band’s contributions to the Duke’s Folk cassette (although that was a little before my time). If you only know Fiddler’s Dram from their 1979 hit single ‘Daytrip to Bangor’ then do yourself a favour and check out their pre-Top of the Pops recordings – pretty much their entire recorded repertoire has recently become available as a download, and that first album in particular has a number of great songs and arrangements which have really stood the test of time. I had the words of this song from Roy Palmer’s classic book A Touch on the Times, and I assume that’s also where Cathy Lesurf and the band had got it from. Roy doesn’t give a source for the tune, so I wonder if it was actually made up by his wife Pat. In the book it’s given in 4/4, whereas Fiddler’s Dram played it in 6/8. Whether that was deliberate or an accident I don’t know, but I think it benefits greatly from the change. In my student days I used to sing this with Caroline Jackson-Houlston. She sang the tune, and I sang John Jones’ harmony part from the record pretty much note for note. I’m not sure I could improve on it and would most likely end up doing exactly the same were I to attempt a harmony now. Although I’ve not sung the song often since those days, it’s never been too far from my mind. So when I visited Nick and Lizzie Passmore earlier this year, this seemed like an obvious one to try together. Mind you, I think Nick had been expecting to play it on guitar, so was somewhat wrong-footed by my suggestion that he should give it a melodeon accompaniment. Needless to say, he rose to the challenge and obliged. This is the last of the four songs we recorded that weekend – must be time to plan another trip to Llandrindod Wells. There’s only one entry for the song in the Roud Index: ‘The Rigs and Fun of Nottingham Goose Fair’ from the Madden Collection, which is unfortunately not available online. Another ballad with the Fair as a setting is ‘The unconscionable batchelors of Darby: or, The young lasses pawn’d by their sweethearts, for a large reckning, at Nottingham goosefair; where poor Susan was forced to pay the shot’, which Early English Books Online dates to between 1687 and 1695. It’s not an especially entertaining song, but no doubt it pleased the good people of Nottingham by providing them with another example of just how untrustworthy young men from Derby can be. Meanwhile ‘The Country Squire’, included in Bentley’s Miscellany, Volume 9 (1842) purports to tell “An Ancient Legend, Showing How The Fair Held Every October At Nottingham Was First Called Nottingham Goose Fair”. It’s nonsense of course and, again, not particularly amusing. 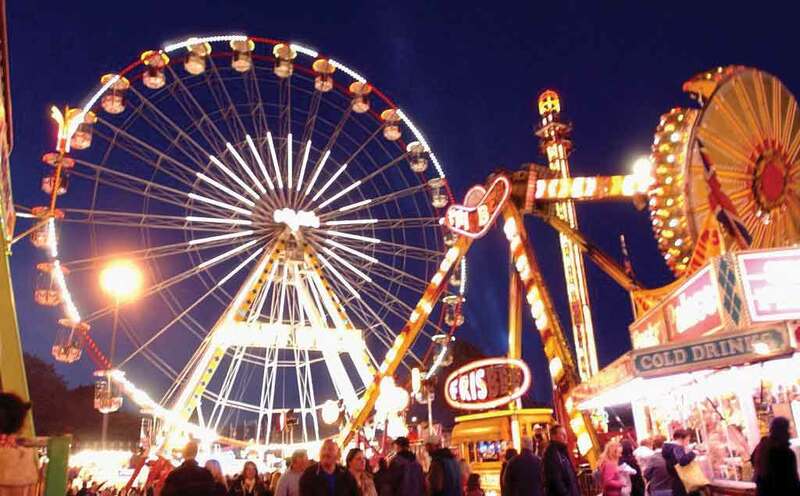 You’ll find plenty of information online about the history of Nottingham Goose Fair, however. The fair dates back to the granting of a charter by Edward I in 1284, and it’s still going strong to this day – in fact it’s on right now (although you’re unlikely to spot any geese). My strongest impression is of the surging crowds moving ceaselessly round the fair. It was impossible to change direction once one was in the stream. Gangs of young people, and some older ones, formed “crocodiles”. Linked together by arms on the shoulders, or round the waist of the person in front, they forced a passage through the crowd. There are a couple of Pathe newsreels of the Fair which you can view online, from 1935 and 1947. In the earlier of these, you see a dignitary, presumably the Lord Mayor of Nottingham, pronouncing the fair open. He concludes “Get you straight away, and thoroughly enjoy yourselves”. This echoes the sentiment of the song. Although, perhaps unwisely, he neglects to repeat the song’s warnings “in moderation pleasure take” and “keep an eye upon your purse”. Nottingham Goose Fair, Market Place, 1890s. From the Nottingham Hidden History Team blog. Picture credit: The Paul Nix Collection. which is not a line I’ve encountered in any other songs. The song is in Roy Palmer’s A Taste of Ale, and it’s one of the pieces included on the Magpie Lane CD brought out to accompany the book. It was written by the British stage actor and silent film star Arthur Lennard (1867-1954) published in B. Mocatta & Co’s Second Comic Annual (exact date unknown – late 19th century). The song has been collected a couple of times in oral tradition – by Fred Hamer in Cornwall, and by Sam Steele from Charlie Giddings in Cambridgshire. In fact you can hear Charlie Giddings singing the song on the Veteran CD Heel and Toe (although I have to confess that this is one item in the Veteran catalogue I don’t own, and have never heard). I dare say that there were actually many more country entertainers who had this in their repertoires, but it’s not the sort of thing that folk song collectors would have been interested in at one time. Certainly those of Cecil Sharp’s generation would not have given it a second thought. And while I’m glad that collectors such as Mike Yates and John Howson have taken a much more open-minded approach to their work, I can’t say I really blame Sharp et. al. for ignoring songs like this. After all, even at the time of Sharp’s death, this song was probably no more than 25 years old. So collecting it then would have been comparable to collecting, say, ‘Nothing Compares 2 U’ today. In Sharp’s pre-war heyday, it might have been more analogous to a modern day collector making a field recording of that X-factor wannabe’s ballad of choice ‘You Raise Me Up’! Three unrelated song fragments, none of which is long enough to deserve an entry of its own. This was the shortest song Jim knew and he had developed a terrific speed in the chorus “Twenty, eighteen, etc.” and thereby frequently qualified for the free pint of beer offered by the landlord of the local inn to the first man to sing a song. I learned ‘Lord Rothschild’ from Mike Waterson’s eponymous 1977 LP. Recently I heard a recording of him singing it at Sidmouth, circa 1988. In the intervening years he must either have discovered – or made up – additional verses to the song; having learned his original two verses more or less without trying, I’ve stuck to those. a 1915 song with words by Bert Kalmar and music by Joe Cooper. To get back home to you. The song is a play on words, as Green River was a popular brand of whisky at the time. The popular vocalist Billy Murray recorded the song for Victor Records in 1915. And indeed you can listen to that 1915 recording, played on a 1905 Victor Type II Talking machine, on YouTube. There’s quite a lot more to it than the chorus which I learned from Bob Davenport. And the words aren’t the same! Oh well, it’s an aural tradition. In the 1970s I spent hours in record shops, flicking through the racks – rarely buying, just reading the backs of the album sleeves. Thus I was aware of Richard Thompson – ex-member of Fairport, played in the Albion Country Band but left before they recorded Battle of the Field – long before I had ever heard his music. I think the first time I heard him on record would have been on Morris On, or possibly Liege and Lief – in either case several years after those records were originally released. The first time I heard him centre stage was the Richard and Linda Thompson album Hokey Pokey. They had a copy of that in the local record library. It stood out because of its eye-catching cover, but also grabbed my attention because I knew of several of the supporting musicians (Aly Bain, John Kirkpatrick, Simon Nicol) from other records. That record gets a bit of a bad press from some critics, mainly because of the inclusion of several rather lightweight songs, like ‘Smiffy’s Glass Eye’ and ‘Georgie on a Spree’. OK, those tracks might not appear in a Richard Thompson Top 20, but they’re perfectly good songs. I have always had, and still have, quite a soft spot for the album. And it certainly isn’t without a few RT gems: ‘Never Again’, ‘A Heart Needs a Home’ and the dark self-loathing of ‘I’ll Regret It All in the Morning’. (Incidentally the library’s copy jumped in a couple of places on the title track; when I bought myself a clean copy from a stall in Ashford market it took some while to get used to hearing the line “It’s the best that they ever did sell”, which previously I’d always heard as “It’s the bell”). If asked to name my favourite Richard and Linda Thompson album I might mention Shoot out the lights but would probably plump for the austere beauty of Pour down like silver. But actually that’s mere posturing. Deep down everyone knows that their greatest album was the first, I Want to See the Bright Lights Tonight. That’s one of those records where it’s not just a case of saying “there’s not a dud track on it”; every song is a Thompson classic: ‘The Great Valerio’, ‘Withered and died’, ‘Has he got a friend for me?’, the title track and, of course, this song, which – understandably – has become a folk club standard. I don’t think I have anything to say about the song itself, except to note in passing that, for a man who doesn’t drink, Richard Thompson has written a lot of good songs about drunks. This recording was made a couple of weeks ago when we went to stay with our very good friends Nick and Liz Passmore in Powys. I took the opportunity of Nick’s multi-instrumental talents to record a few songs for the blog, and these will be dropped in at strategic intervals over the next few months (one, in fact, has been earmarked as appropriate to mark the end of the fourth year of this blog). I don’t think Nick and I had ever played any of these songs together before, but we’d known them for 35 years or more – i.e. for at least as long as we’ve known each other. You may have seen Nick dancing with the Shropshire Bedlams. He featured on (indeed he played one of my compositions on) the Fflach squeezebox compilation Megin. In the late 80s / early 90s he was a member of what I think was the final line-up of Crows, and also played alongside Chris Wood, Chris Taylor and me in the dance band Polkabilly. And if you were around in the Canterbury area in the 1970s you would have known him as one of the mainstays of Duke’s Folk, the renowned folk club run by Dixie Fletcher at the Duke of Cumberland in Whitstable. That club was a veritable hotbed of talent, including among its regulars Fiddler’s Dram, and the members of the Oyster Ceilidh Band. In those days Nick mainly played guitar, mandolin, mandola, bouzouki, whistle and flute. Since then he has added anglo-concertina, melodeon and fiddle to the list (and quite probably several others) while with Polkabilly he’d also play a bit of piano, if the venue had one. When we played the Dance House in Cricklade, while we played the final waltz the piano was actually lifted off the stage by several strong men, to make sure the Town Hall caretaker didn’t realise it had ever been lifted onto the stage in the first place… Fortunately Nick was playing one of his other instruments at the time. With Nick Passmore – session at the Whitby Festival 1989. (The elbow on the right of the shot belongs to Northumbrian fiddle-player Willy Taylor). This song was collected by Bob Copper in 1954 from George Attrill of Fittleworth in Sussex. If a song is all the better for the singer knowing what he is singing about – and I believe this to be true whether the subject of the song be fishing, ploughing, mining or loving – then there could never have been a man better qualified than George to sing this song. Every lunchtime of his life would find him in the Swan at Fittleworth where ten or twelve pints of mild would slip smoothly and rapidly down his gullet before lunch could be considered complete. And he would round this off with another five or six leisurely pints in the evening. I have never heard a recording of George Attrill singing this, so I’m not sure how far my tune departs from what he sang. Certainly the tune is transcribed differently in Songs and Southern Breezes and Peter Kennedy’s Folk Songs of Britain and Ireland which is, I think, where I first encountered it. From Bob Copper’s book it seems that when George sang it, all four lines of the verse used pretty much the same tune. Whereas in Kennedy’s book the third line is quite different (and that’s how I sing it). There’s also a divergence in the chorus. Peter Kennedy has the ascending line on “Old and young thy praise have sung” starting on the tonic. I start the run one note higher, and – having looked again at Songs and Southern Breezes – that’s how it’s given there. I’ve heard it sung both ways. Right or wrong, I think my tune has a bit more interest to it – but it does make it a song worth avoiding in folk clubs and sessions, unless you’re a fan of dissonance. There’s a Mudcat thread on this song, from where I learn that the song was originally composed – with a significantly different tune – by Joseph Bryan Geoghegan in around 1860. 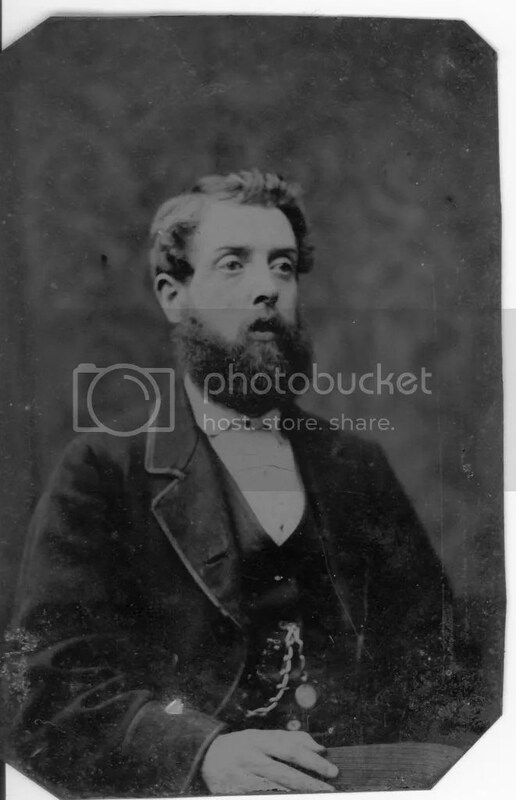 Joseph Bryan Geoghegan, 1816-1889. Image found via a Mudcat discussion on the composer of this song. John Barleycorn. Ballad printed between 1863 and 1885 by H.P. Such, London. From Ballads Online. Bing Lyle. Photo from the Brighton Acoustic Session blog. I don’t sing very many modern songs in public, but occasionally I come across a song and know immediately that I want to learn it. That was the case with ‘Between the Wars’ and it was the case with this one too. It was written by Bing Lyle, and I first heard him sing the song at Wingham Folk Club, near Canterbury, circa 1986. I’d known Bing a bit for some years – he would occasionally turn up at Oyster Morris / Band events and turn in a crowd-pleasing performance of, say, ‘I’m an old cowhand from the Rio Grande’, or ‘Little Red Rooster’. I got to know him better in the mid-1980s, when we both found ourselves living in Faversham for a few years. Having heard him sing this at Wingham, and decided that I wanted to learn the song, I then had to wait some years before I heard it again. He moved away to Brighton, then I moved to Oxford, and although our paths would cross from time to time, it seemed to be in situations where Bing was singing more traditional material (we were both involved, for instance, with The Keys of Canterbury, Pete Castle’s first Kent-themed compilation). In the nineties, however, Bing teamed up with fiddle-player Ben Paley, and they recorded the CD We are melting. Which, among a number of other good songs written by Bing, included ‘Painting the Town’. I have unconsciously changed the tune a bit over the years. And consciously changed one of the lines. In the last verse, the original lyrics say “a million to one, it’s not you”. I learned the song round about the time the National Lottery was launched, in which the odds of winning were famously calculated to be around 14 million to one. So the odds of achieving happiness on “the big wheel of happiness” were correspondingly lengthened. You’ll search the Internet in vain, I’m afraid, for a Bing Lyle web page. There’s not even a photo of him on the website of the Sussex Pistols, the Brighton-based dance band he plays with. However, I was pleased to find this 2011 video of him singing ‘Painting the Town’ at the (sadly now defunct) Royal Oak folk club in Lewes. It is of good ale to you I’ll sing And to good ale I’ll always cling, I like my mug filled to the brim And I’ll drink all you’d like to bring, O, good ale, thou art my darling, Thou art my joy both night and morning. A rather wonderful event took place yesterday at Cecil Sharp House – Ten Thousand Times Adieu, the Bob Copper Centenary Event, aka Bobstock. I wouldn’t have missed it for the world, and in the event was delighted to be able to take part, deputising for Tony Engle in a one-off reunion of the seminal quartet Oak (last previous performance, 1972!). Here’s a hot-off-the-press review of the event on the Guardian website. At the end of the night, all the invited performers got up on stage to join three generations of the Copper Family in singing ‘Thousands or More’ and ‘Oh Good Ale’. Blasting out those two songs, standing just behind John Copper (I suspect our relative heights may mean there will be no photographic evidence of my presence on stage at that point!) and next to Maddy Prior (who must take a lot of the blame for getting me hooked on traditional music as a teenager) is something I won’t forget in a hurry. if we used to go out with the local pub to a darts match or something like that, on the way back we’d drink plenty of beer, but we always drank singing beer, not fighting beer, that’s a very important distinction. It doesn’t matter how much singing beer you have, but you don’t want any fighting beer. Good ale thou art my darling, published by H. Such between 1863 and 1885; from Broadside Ballads Online. 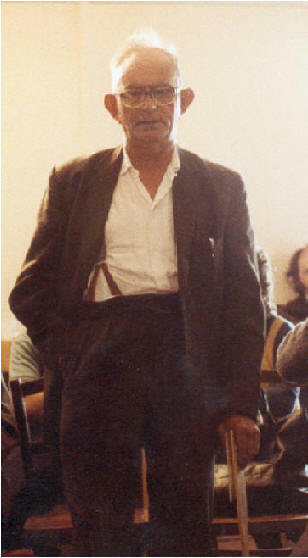 Fred Whiting. Photo by John Howson. Like last week’s song ‘Who Owns the Game?’ this was recorded by Mike Yates and John Howson from the Suffolk singer Fred Whiting, and I learned it from the LP Who Owns the Game? – which, contrary to what I initially wrote last week, is available on CD from Veteran. And once again, Fred Whiting seems to be the only known source for the song. It’s amazing, you know, what some of those old boys could drink too. I was playing in Rishangles Swan once and there was an old boy called Swaler Parrott and nearly every five minutes he’d bang on the bar and shout “I’ll have another skep”. Five minutes later “I’ll have another skep” (pint), and he must have had 18 pints that night, and do you know he walked home as straight as a crow in a rain storn. Old Cropther Harvey from Redlingfield – nearly all his songs were about beer-drinking, and that’s where I learnt that song Poison Beer from. My dad used to knock about with him – they were both shepherds and both sang beer songs – “If you want to get rid of yer beer, I’ve got plenty of room down here”. Beyond that, I know nothing about the song. But presumably it dates from the second half of the nineteenth century, when the Temperance movement was in full swing.